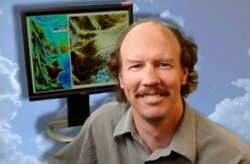 Congratulations to Steve Ghan, recently re-appointed to another 4-year term as editor for the Atmospheres section of the Journal of Geophysical Research, published by the American Geophysical Union (AGU). In his role as editor, Ghan has the authority to accept or reject papers, as well as the responsibility for attracting new and interesting research to the journal. He and his co-editors have emphasized timeliness in the manuscript review process, consequently reducing the review time by two weeks. Ghan is highly recognized for his expertise in developing, evaluating, and applying parameterizations for climate models, including aerosol interactions with clouds. He holds a Ph.D. in Meteorology from the Massachusetts Institute of Technology. The AGU is a worldwide scientific community that, through cooperative research, advances the understanding of earth and space for the benefit of humanity. It publishes more than a dozen peer-reviewed journals ranging from earth and oceans to atmosphere, space, and planets. For more information about the AGU, see their website.